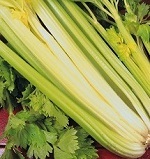 A mild flavoured, open pollinated, celery with yellow-green stalks. Self-blanching, Green stems with very little stringiness. quick to mature and stands well. Something of a novelty with red blushed stalks. Very hardy traditional variety.